How would you like a unique opportunity to travel Route 66 in a vintage vehicle? On Saturday May 31, 2014 Rich Eichorst and his group the American Association of Railroaders will be running his Vintage 1958 Trailways bus up Route 66 between St. Louis and Litchfield, Illinois. Cost of the trip is $66.00 and includes an all you can eat noon buffet lunch. Departure time from Lansdowne Avenue is 8:30 AM. Departure time from North County is 9:00 Am Bus will return to the St. Louis Area by 4:00 PM. Outdoor art at Laumeier Sculpture Park in St. Louis County, MO. Photo by Carolyn Hasenfratz. Laumeier Sculpture Park is located just off the Watson Road alignment of Route 66 in South St. Louis County. If you’re heading west, make a left turn on Geyer Road just before you reach Interstate 270 and you’ll see the park entrance shortly. If you’re looking for a place to pull of the road for a little while for a walk or a picnic, this park is ideal. You can stroll on nature trails and open grassy areas while viewing a variety of outdoor sculpture. Bring the kids, because there are many art works that are meant to be climbed on or interacted with in some way, some designed specifically for younger visitors. Also bring your dogs – there is a series of six sculptures that is designed partly to make you think about the relationship between dogs and humans, and party to provide an interactive activity area for dogs. There are even special sights and sounds to appeal to canine senses! On a recent visit I spent about an hour and a half exploring the park on foot at a fairly leisurely pace and saw many but not all of the sculptures. I think Route 66 fans, who are usually partial to ruins, will especially enjoy “Pool Complex: Orchard Valley” by Mary Miss. This site-specific work consists of wood add-ons surrounding the ruins of a large swimming pool which incorporates the type of regional native rock work that Missouri Route 66 aficionados are so familiar with. See a short video about the workhere. There is also a historic spring house in the park which is an unaltered example of the same type of beautiful stone construction. See more of my photos of the park in this album. News stories about Route 66 from all over the world! June 15, 2013: Can electric cars save Route 66? March 7, 2011: Danish students make the trip on Route 66 from Chicago to L.A.
March 5, 2010 – Historic Route 66 seeing new life as a bicycle route? December 9, 2010 – Relive America’s history along Route 66, starting in L.A.
November 22, 2009 – “It was a hot time in the old town tonight..” – Newer addition removed from the historic Wagon Wheel Cafe building. September 13, 2009 – Route 66 is alive in Williams, Ariz.
May 9, 2009 – Route 66 Road Trip: Okla. to N.M.
April 4, 2009 – Route 66 Race to Rocker gets blue skies and high fives – JOG, inc., a local running club, staged its first annual Race to the Rocker. December 7, 2008 – Route 66 signs will be better than new – A protective barrier is being installed to prevent vandals from doing other damage. April 1, 2008 – World’s Largest Rocking Chair erected on Route 66 in Fanning, Missouri. March, 2008 – Route 66 candy bars introduced by the Route 66 Fudge Shop in Cuba, Missouri. January 2, 2008 – Java.net opens in Cuba, Missouri. 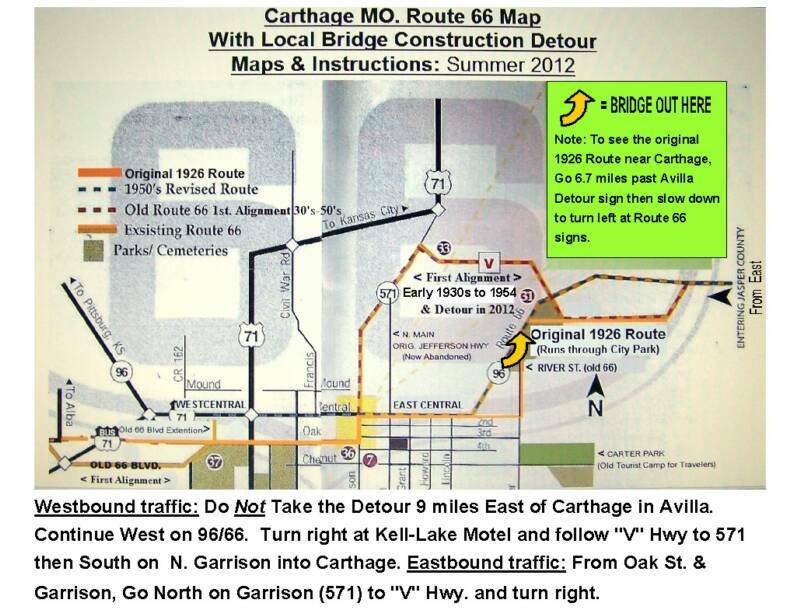 December 12, 2008 – Get your fix on Route 66 – Route 66 Fudge Shop in Cuba, Missouri opens. City of Cuba Mural Update May 2007 – New mural on the on the old garage bays of the restored Rt. 66 Phillips 66 station. Route 66 in Top 3 of Southern Scenic Drives according to the readers of Southern Living Magazine, who ought to know! Read the whole article here: What You Voted the Best of the South In Our 2006 Readers’ Choice Awards. Jim Ross and Shellee Graham have launched a new Route 66 Photography web site. The St. Clair Historical Museum has a new display featuring Route 66 in Franklin County, Missouri. See the press release for more details and vistitor information. Paid Parking Starts May 1st, 2006 at Old Chain of Rocks Bridge – see the press release from Trailnet for more details. must see attraction on Route 66. Read more here. CNN/Money, May 23, 2002: Summer drives: Route 66 : You can still get your kicks, you just have to look a little harder. Daily Egyptian, January 30, 2002: Cloud Nine: made of asbestos and neon?